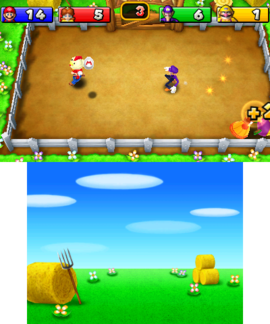 Truckin' and Cluckin' (Hen Party in PAL regions) is a General minigame from Mario Party: Island Tour. Yellow Toad, Blue Toad, and Purple Toad are in an arena. A chicken comes out and Blue Toad grabs it and starts running around with it. Then the minigame begins. In this minigame, the players must hold chickens and make them lay as much eggs as possible until they run out. The other players will try to tackle that player to grab the chicken from them. Each egg is worth one point. There are also golden chickens, which are worth two points instead of one. Rules – "Grab a chicken, and try to hold on to it while it lays eggs. Tackle your opponents to steal their chickens." This page was last edited on October 11, 2017, at 11:02.